If you need to add or subtract years, months, weeks, days or even hours, minutes and seconds, this formula builder will remarkably save your time. Whether you want to know the number of days between two dates, calculate elapsed time, or get age from birthday, a corresponding formula is only a couple of clicks away. 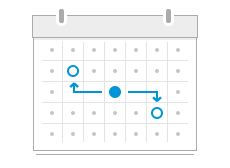 Build formulas for dates in ExcelJust choose the operation and cells and let the add-in create a custom-tailored formula for you. Add and subtract datesAdd a desired number of years, months, weeks and days to a date, or subtract any of these units. Calculate difference between two datesChoose one of 15 combinations to calculate the difference between two dates in years, months, weeks, days or any combination of these units. Compute dates and times in one goAdd or subtract not only date values, but also hours, minutes, and seconds, all with a single formula. Convert birthday to ageUse the age calculator to get a person's age from their date of birth based on today's date or a specific date. Get reusable formulasOnce you get the formula, you can use it on any computer without the add-in installed. The tool uses only Excel math and no custom worksheet functions. What is Date & Time Formula Wizard and what do I need it for? Date & Time Formula Wizard is a formula builder for Microsoft Excel. It creates formulas to calculate the difference between two dates, add or subtract years, months, weeks, days or even hours, minutes and seconds. Can't I do the same without any add-ins? Sure, you can write all the formulas yourself using Excel alone. 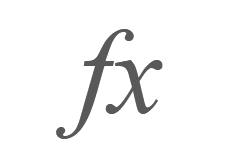 The formula builder uses only Excel math and no custom worksheet functions. It just simplifies and accelerates this process, dramatically saving your time. How can I add and subtract dates with this add-in? To add or subtract, first you should select the cell where you want to put the result. Then you run the add-in, enter the date or select a date cell and enter the quantity or select cells with years, months, weeks, days, hours, minutes and seconds. You will see the result of the calculation under Formula result. Click the Insert formula button. The formula will be inserted in the selected cell. 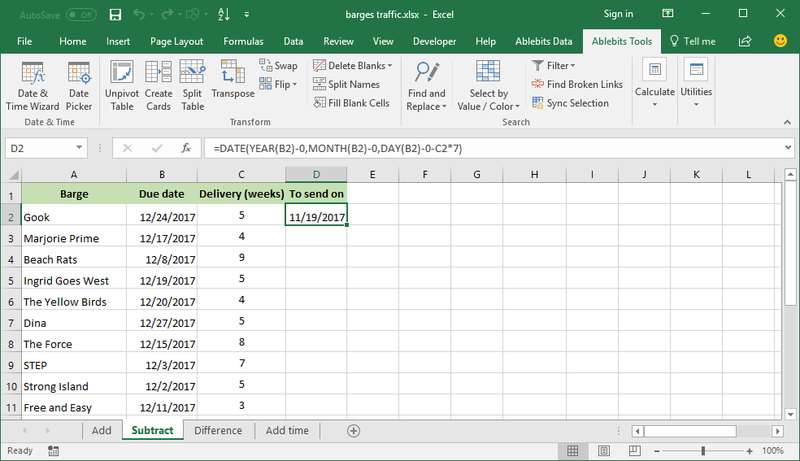 For more information, please see How to add and subtract dates in Excel. 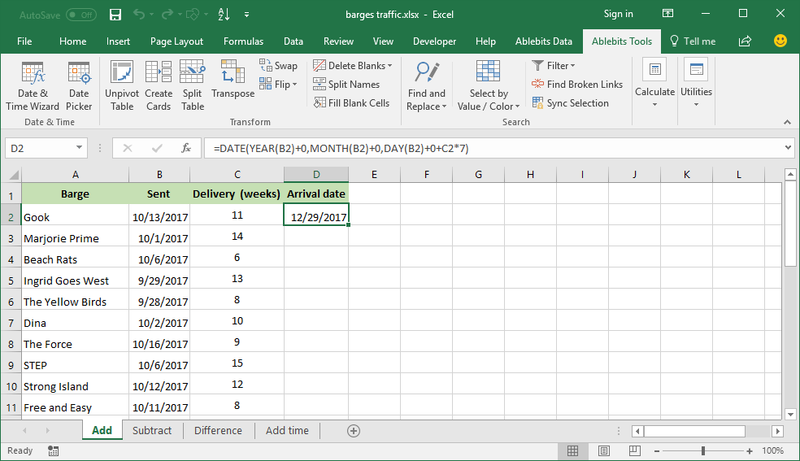 What about the Excel date difference calculation? If you need to calculate the difference between two dates, go to the Difference tab. There you will see three boxes to fill in: Date 1, Date 2 and Difference in. 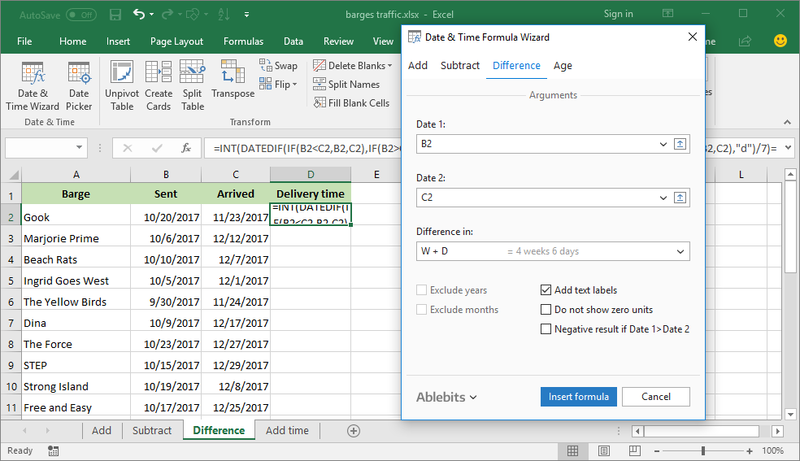 Unlike the Excel DATEDIFF function, our Date & Time Formula Wizard does not care about the order of the dates (start date and end date), it can output the result as a positive or negative number. After entering the dates, you select a format. 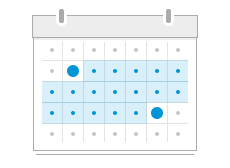 For instance, you can calculate the number of days between two dates; or show the difference in years, weeks and months; or weeks and days; etc. Once you click the Insert Formula button, the formula displayed in the Formula result section is inserted in the selected cell. The detailed steps can be found here. 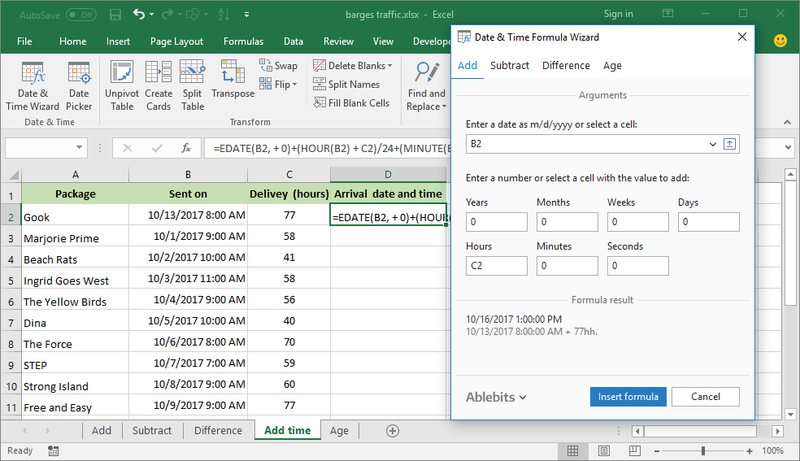 How to calculate age in Excel with Date & Time Formula Wizard? 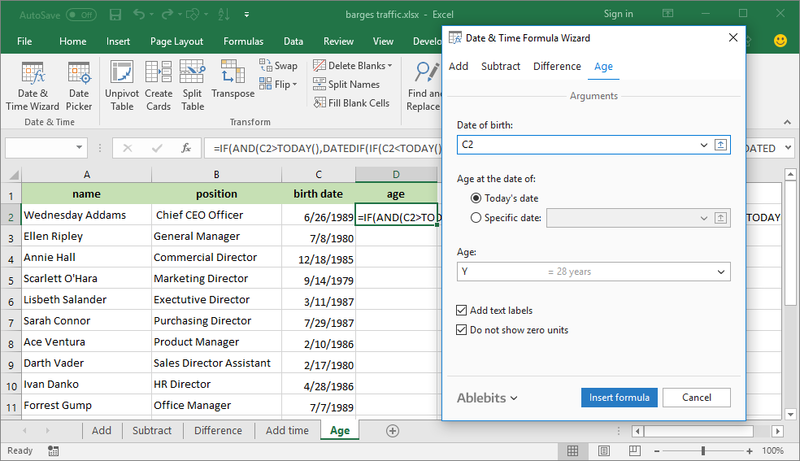 To create a formula to calculate age in Excel, switch to the Age tab. Select a cell with the birth date or enter it manually. Choose, whether you want to calculate age at today's date or a specific date. On the preview pane you will see the calculation result. 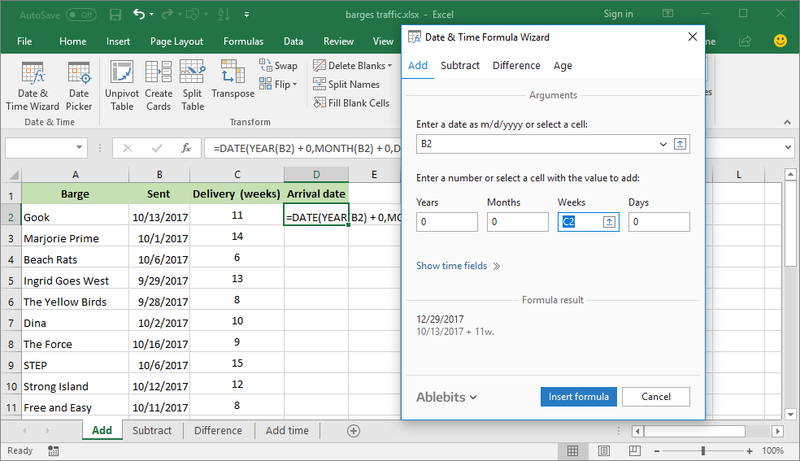 Click Insert formula to get the Excel age formula inserted in your worksheet. For more information, please see How to get age from birthdate. In what formats can I have the date difference displayed? Can I get the difference between two dates with text labels? Sure. 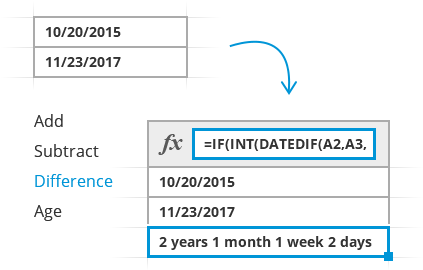 When calculating the date difference in two or more units, select the Add text labels option to make the result more understandable. I want to know only the number of weeks or days between two dates, is it possible? Yes. You can select a single unit in the Difference in box. Or, you can remove years and months from your calculations by selecting either the Exclude years or Exclude months option.